How David Lynch was casting his "Blue Velvet" and how he works with the same cast most of the time, as well as what were his reasons to casting Kyle MacLachlan. Lynch met Isabella Rossellini at a restaurant in New York and a few days later decided to offer her the part. Rossellini wanted to do the part and understood it right away. Rossellini had said the reason she liked the role because, it was a role she has to portray different to the usual femme fatal. The charactor was dark and sexual, though she is beautiful and sang like others, inside of her, she was totally destroyed, and she didn't know what she wants, rather to the usual femme fatal who is portrayed as if she knew exactly what she wanted. In "Blue Velvet" for the character of Frank Booth, Lynch wanted Dennis Hopper, but was passed over due to alchohol problems that Hopper was going through. Then the surprise call from Dennis Hopper himself came to Lynch saying that Hopper understood Frank Booth's character saying to Lynch that he is Frank. At the time when Hopper called him, Lynch was already on the set in North Carolina filming. They have never met before. Lynch was with Isabella and Kyle MacLachlin and said to them that he just got off the phone with Dennis Hopper and Dennis had said that he is Frank Booth, it's good for the film, but how would they have lunch with Dennis. I think it was convincing enough to Lynch, so Dennis Hopper became Frank Booth in the movie. Blue Velvet was filmed in Wilmington, North Carolina at the De Laurentiis Entertainment Group (DEG) Studios with outdoor shots being filmed in the town itself. People in the town did not realize the nature of the film, so they all have come to watch the filming on the street as if they were going on a picnic, with fruit baskets, blankets and with grandmothers and children. Even though Isabella Roselini had asked the assistant director to warn them that the whole scene will be naked, yet people have still stayed behind according to Rosalini. The next day a notice from the police told the production that they would not be given any more permits to shoot in the streets of Wilmington, North Carolina. I am just thinking to myself, it doesn't have to be North Carolina, it can be Colombo too. Because when I was shooting my first feature film "Sihina Deshayen" (Vail's of Maya) in 1992 at Gallface hotel, I had a scene where Roger Seneviratne who played Vishva's character had to get out of the bed naked and walk away to get his clothes. Even though I have asked the assistant directors not to let anyone into the grand ballroom in the hotel, few have sneaked into the shoot from the roof area and they have been watching the shoot. Well we didn't quite manage to finish the scene on the same day, we had a balance left and had to come next day to finish it. Unfortunately the hotel refused to give us permission to shoot in the hotel. I asked them why and they said it will bring a bad image to the hotel and we don't know what kind of a movie you are making. To me it sounded as if they have already thought that we were making a "Last Tango in Paris". Lynch managed to finish the film and when it was released there were very mixed critiques. Pauline Kael of "The New Yorker" magazine called Lynch that he may be the first populist surrealist and some ways compared to Frank Capra. J. Hoberman of "The Village Voice" loved it and went to the extend he called that, there has not been an studio film so rich, so imaginatively cast and wonderfully acted. But on the other hand some critics like Roger Ebert hated it and called it a cheaply shot campy strength denying film. Rex Reed on "At the Movies" has called it a sick movie. Some feminist and women's groups were upset for the portrayal of Dorothy's masochism and they thought the film encouraged the violence towards women. Commercially, the film wasn't a huge box office success. It took in just over $8 million domestically, not much more than it's $6 million budget. But combined with overseas grosses the film made back De Laurentiis a respectable return on his investment. Not only did it earn Lynch his second academy award for directing, it also cleared the way for his biggest commercial success to date, Twin Peaks. When "Twin Peaks" the TV series came out in sometime in April 1990....if you even accidentally called a friend at the particular time when it was broadcasting, either they would pick up and say "This better be important....Twin Peaks is on air right now" or simply never answered the phone. It was the biggest thing; we would never miss that one hour on TV. The closest reaction I can imagine is in Sri Lanka is maybe "Ran Depeya" the MEGA SERIAL. (Though it is not cult, I think it has made help make cult groups in Sri Lanka to critizize the crazy mega serials in Sri Lanka). The Idea has come when Tony Krantz, Lynch's agent suggested him that he should do a TV show something like Blue Velvet. "You should do a show about real life in America - your vision of America the same way you demonstrated it in Blue Velvet "Mark Forrest and Lynch were having coffee near the corner of Laurel Canyon and Venture, the Idea of a body washing up on the shore of the lake has come in to their minds. They started writing it and they pitched the idea to ABC (network) when Writers Guild Of America was on strike in 1988. ABC loved the idea and let them make the Twin Peaks. When it comes to rankings Twin Peaks was ranked on TV guide magazine's 2002 "Top 25 cult shows" at No. 20, and one of the "Top 50 TV programs of all time" by the same guide at No. 45. In 2007, Canal 4 (UK) ranked Twin Peaks 9 on their list of the "50 Greatest TV Dramas". Also that year, Time included the show on their list of the "100 Best TV Shows of All-Time"
Then he went and made Twin Peaks Fire Walks with me the movie. I saw it in 1993 when I was living between A and B on 2nd street in the East Village New York City and I hated it. I think one of my biggest expectations was because this was the moment; the two David's in my life came to work together. I was waiting to see this and I was waiting for the happening of this. The scene was fantastic probably one of the best scenes or if not the best scene in the movie. David Bowie appeared as Pillips Jefferies. It was an amazing treat for me, cause Bowie has been probably one of the main influences in my artistic life. Mangala Samaraweera, who was the fashion designer to my father's Buddhi Batiks at Marawila that time in 1982. He introduced me to the world of David Bowie. 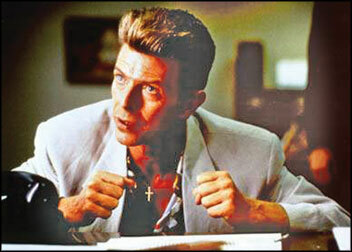 I think the world of David Bowie is also an interesting one as David Lynch's world. Fire Walk With Me was received poorly, especially in comparison to the series. It was greeted at the Cannes film Festival with booing from the audience and met with almost unanimously negative reviews by American critics. The film fared poorly in the, partially because it was released almost a year after the television series. 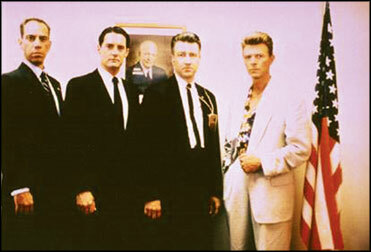 Indeed, the film provided no conclusion to the events of the season two finale, primarily because David Lynch agreed to make the film under the premise of a third season, leading to the creation of new characters intended to appear in the nonexistent third series, such as 'Judy', mentioned briefly by Dvaid Bowie's character. I personally didn't like Fire Walk With me. I left David Lynch's world after great disappointment. Actually, I did not go to watch any of his movies for a while. Same thing happened to me with David Bowies music. I started getting away from the two masters for a while. But mean time, In 1997, Lynch returned with the non-linear, noir like film Lost Highway co-written by Barry Gifford and starring Bill Pullman and Patricia Arquette The film failed commercially and received a mixed response from critics. However, thanks in part to a soundtrack featuring David Bowie Nine Inch Nails and The Smashing Pumpkins, it helped gain Lynch a new audience of Generation X viewers. In 1999, Lynch surprised fans and critics with the G-rated, Disney-produced The Stright Story, written and edited by Mary Sweeny which was, on the surface, a simple and humble movie telling the true story of Iowan Alvin Sraight, played by Richard Fransworrth, who rides a lawnmower to Wisconsin to make peace with his ailing brother, played by Harry Dean Stanton. The film garnered positive reviews and reached a new audience for its director. Lynch approached ABC once again with an idea for a television drama. The network gave Lynch the go-ahead to shoot a two-hour pilot for the series Mulholland Drive, but disputes over content and running time led to the project being shelved indefinitely. With seven million dollars from the Studio-Canal Lynch completed the pilot as a film. Mulholland Drive is an enigmatic tale of the dark side of Hollywood and stars Naomi Watts, Laura Harring and Justin Theroux. The film performed relatively well at the box office worldwide and was a critical success earning Lynch a Best Director prize at the 2001 at Cannes Film Festival (shared with Joel Coen for The Man Who Wasnt There ) and a Best Director award from the New york Film Critics Association. Film critic Roger Ebert was notoriously unfavourable towards Lynch, accusing him of misognyny in his reviews of Blue Velvet and Wild at Heart. Ebert reacted positively to The Straight Story and Mulholland Drive writing positive 4/4 star reviews for both. At the 2005 Cannes Film festival, Lynch announced that he had spent over a year shooting his new project digitally in Poland. The feature, titled Inland Empire included Lynch regulars such as Laura Dern, Harry Dean Stanton, and Mulholland Drive with cameos by Naomi Watts, Laura Harring (voices of Suzie and Jane Rabbit), and a performance by Jeremy Irons. Lynch described the piece as "a mystery about a woman in trouble". It was released in December 2006. In an effort to promote the film, Lynch made appearances with a cow and a placard bearing the slogan "Without cheese there would be no Inland Empire". And it was by accident, totally by accident, I saw something wired on cable TV some time in 2007. Flipping through the channels I saw in one channel, Laura Dern walking through a dark passage, then I just kept watching it and I thought to myself, wow what a fantastic movie. After a while and with a few more incidents I was thinking oh god, this looks like lynch's work, but wasn't sure. Then when the end credits roll, I realized it is indeed David Lynch's work. Later on I watched the whole movie again. I loved every bit of it. During that time, I came to thinking of making of "Nimnayaka Hudakalawa". Since then I started to re discovering David Lynch through, more mature eyes. David Lynch has twice won France's Cosar Award for Best Foreign Film and served as President of the jury at the 2002 Cannes Film Festival, where he had previously won the Palme d'Or in 1990. On September 6. 2006 Lynch received a Golden Lion award for lifetime achievement at the Venice Film Festival. He also premiered his latest work, Inland Empire, at the festival. Lynch has received four Academy Award nominations: Best Director for The Elephant Man (1980), Blue Velvet (1986) and Mulholland Drive (2001), as well as Best Adapted Screenplay for The Elephant Man (1980). He was also honoured by the French government with the Legion of Honor, the country's top civilian honour, as Chevalier in 2002 then Officier in 2007, and was named the best director in The Guardian's 'The world's 40 best directors' in 2008.